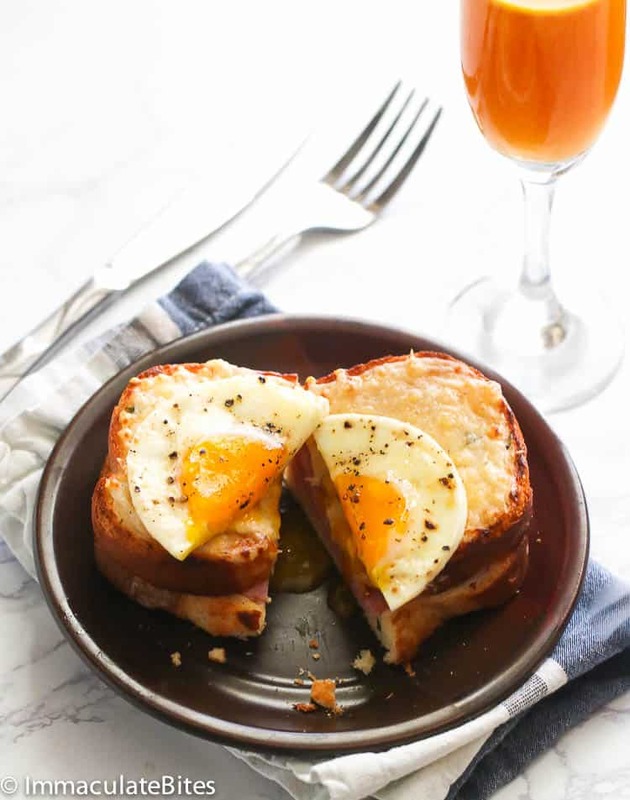 Croque Madame – a very comforting popular French cafe meal- grill ham and cheese sandwich topped with béchamel sauce, Gruyere cheese and fried egg. An ultimate breakfast meal! 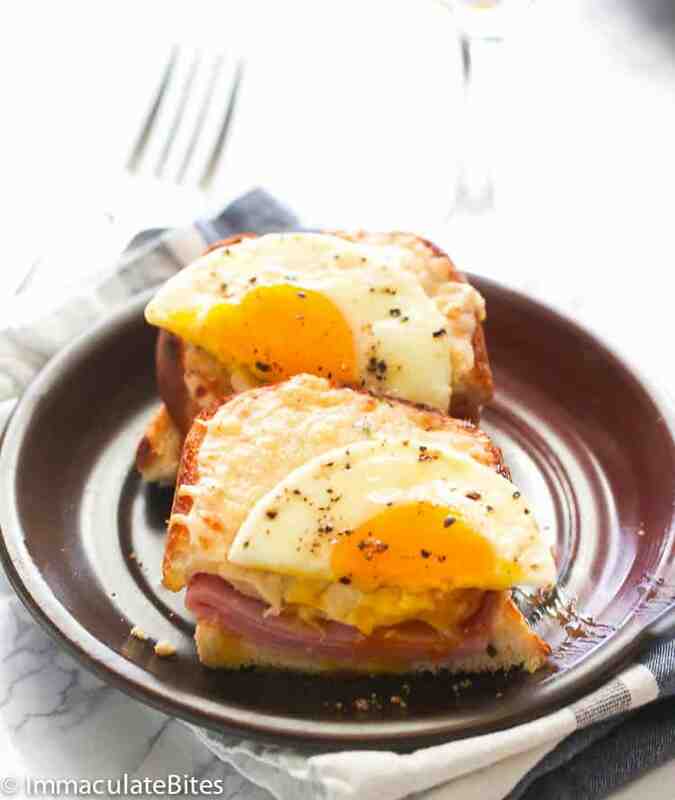 Don’t describe this Croque Madame as just another grill ham and cheese sandwich. No, it is far from it. This bad boy is topped with Béchamel sauce, Gruyere cheese and fried egg. Making it an easy yet decadent sandwich that would bring back all French Café memories, if you have ever been to France. The cheesy goodness from this sandwich embodies comfort food. You will devour this sandwich in less than no time. Trust me. 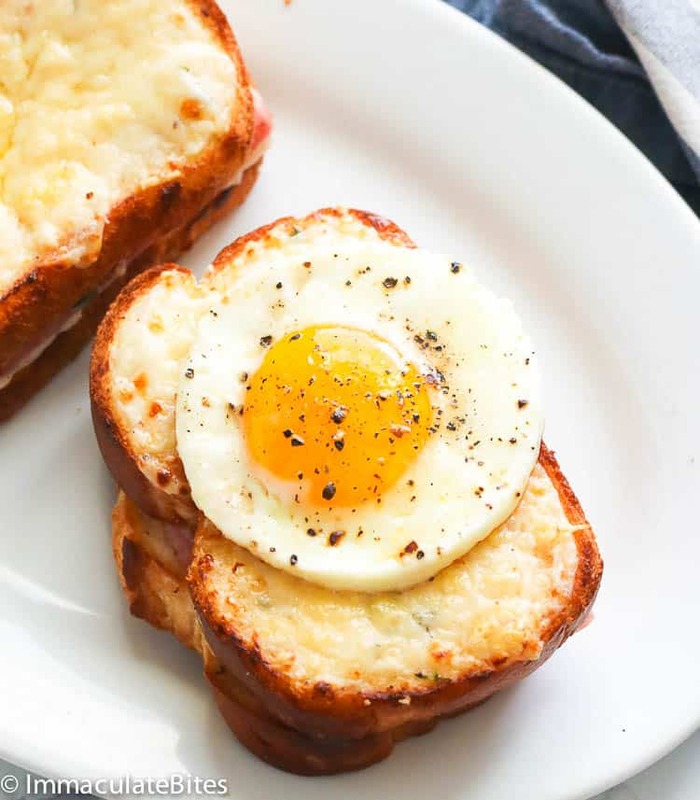 Croque Madame or “Miss Crunch” in English, is a variant of Croque Monsieur (French for “Mister Crunch” which is a baked or fried boiled ham and cheese sandwich. It was first recorded on a cafe menu in Paris in 1910. 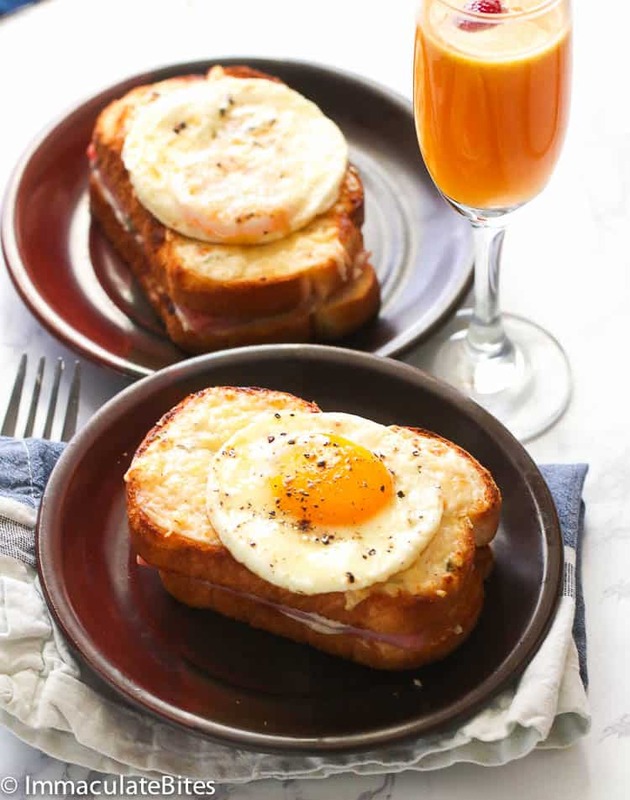 Moreover, many would believe that the egg topped on a Croque Madame resembles to that of a woman’s old fashioned hat. 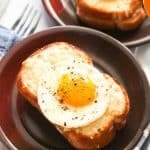 So recently, I have been mildly craving Croque Madame- just not enough time to make the stop at one of my favorite French restaurant at the farmers market here in Los Angeles. This blog, I’m telling you, is keeping me busy – not a lot of time to eat out like I usually do. Now, it is reserved for special occasion or when I take my son out. I am not complaining… love, love what I am doing. Hence, I decided to make a homemade version so I can ‘truly enjoy like I do for years. 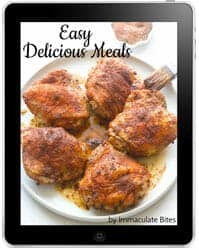 This recipe is one that I got from watching Alex Guarnaschelli– from the Food Network channel. I like the fact that she omits the mustard and use the cheese sauce inside of the sandwich. This method is actually better. It soaks up the bread making it tender and crunchy at the same time! As with most sandwiches, this one comes together quickly- even with the béchamel sauce. You will devour this sandwich in less than no time. Trust me. Words to the wise – eat in moderation. In choosing a bread to use for this recipe, go with a good quality white sandwich loaf or anything that is strong enough to hold the weight of the melted cheese. You may use grill pan to brown the bread. This post was first published on April 2014 and has been updated with new photos and content. Croque Madame - a very comforting popular French cafe meal- grill ham and cheese sandwich topped with béchamel sauce, Gruyere cheese and fried egg. An ultimate breakfast meal! In a medium saucepan, melt 2 tablespoons butter over medium-high heat; add onions stir for about a minute or until foaming. Add flour, continue cooking, stirring frequently for about 1 to 2 minutes or until bubbling. Remove saucepan from heat. Then gently add milk, whisking constantly, until mixture is smooth, add bay leaf and thyme. Return saucepan to heat. Keep stirring with a wooden spoon, for 8 to 10 minutes or until sauce comes to the boil, thickens and coats the back of a wooden spoon. Remove from heat. Stir in Parmesan, salt and nutmeg. Transfer to a bowl to cool. Transfer to a baking sheet and repeat with the remaining slices of bread sandwiches using the remaining butter. Top each sandwich with 2 to 3 slices of ham. Combine half of the Gruyere cheese with the béchamel sauce. Adjust for seasoning. Spread a small amount of the Gruyere sauce on top of the ham and top each with another slice of bread. Spread the remaining béchamel on top of the sandwiches and top with the other half of the Gruyere cheese. Broil until cheese sauce is bubbling and evenly browned, about 3–4 minutes. Meanwhile, if using a nonstick skillet wipe any crumbs from the pan, then add oil. Heat on medium, add eggs, season with salt and pepper, and cook until whites are cooked but yolks are still runny, about 3 minutes. If you prefer a more cooked egg cook a little bit longer till desired consistency has been reached. Place an egg on top of each sandwich, and serve hot. In a medium saucepan, melt 2 tablespoons butter over medium-high heat; add onions stir for about a minute or until foaming. Add flour, continue cooking, stirring frequently for about 1 to 2 minutes or until bubbling. Remove saucepan from heat. Then gently add milk, whisking constantly, until mixture is smooth, add bay leaf and thyme. Return saucepan to heat. Keep stirring with a wooden spoon, for 8 to 10 minutes or until sauce comes to the boil, thickens and coats the back of a wooden spoon. Remove from heat. Stir in Parmesan, salt and nutmeg. Transfer to a bowl to cool. Heat a large cast iron skillet or grill pan until hot, oil with half of the butter then place bread on it and brown each side for about 2 minutes. Transfer to a baking sheet and repeat with the remaining slices of bread sandwiches using the remaining butter. Top each sandwich with 2 to 3 slices of ham. Combine half of the Gruyere cheese with the béchamel sauce. Adjust for seasoning. Spread a small amount of the Gruyere sauce on top of the ham and top each with another slice of bread. Spread the remaining béchamel on top of the sandwiches and top with the other half of the Gruyere cheese. Broil until cheese sauce is bubbling and evenly browned, about 3–4 minutes. Meanwhile, if using a nonstick skillet wipe any crumbs from the pan, then add oil. Heat on medium, add eggs, season with salt and pepper, and cook until whites are cooked but yolks are still runny, about 3 minutes. If you prefer a more cooked egg cook a little bit longer till desired consistency has been reached. Place an egg on top of each sandwich, and serve hot. Thank you so much. God bless you, too! Happy Sunday.